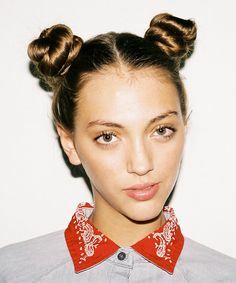 Anytime I rock mini buns I get called Miley, I spent 7 days in the Dominican getting called Miley because of my hair. TBF I was channeling my inner Sailor Moon as a meatball head, but whatever. Hair donuts are great if you are inept with hair styling like I am. Pro tip: all females look cute in a jersey with no pants. For this look however I will be making a suggestion for some bottoms. This adorable pink numbered piece is from Untitled & Co. Become “Queen St. West Barbie” in this. Standard pink skinny jeans; Try these Pretty in Pink ones from ShopJeen. What’s more Tumblr than platforms? What’s more Barbie than pink? These shoes are fantastic, and a great price. Plus, lucky for y’all you can use my special discount code ‘NIKKISIN’ on CuteHarajuku to get 10% off!